Shirts With Random Triangles: (UPDATED): "Block M" on the University of Michigan Diag painted Spartan Green. 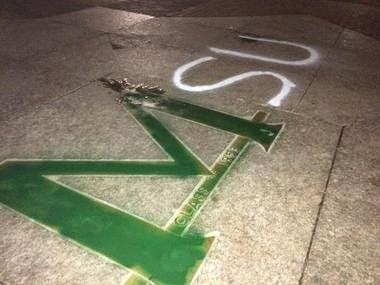 (UPDATED): "Block M" on the University of Michigan Diag painted Spartan Green. The Michigan State marching band has a tradition each year where it holds a "Sparty Watch" the week of the Michigan-Michigan St. rivalry game. Band members hold an around-the-clock vigil to prevent Michigan fans from vandalizing the Spartan statue on the Michigan St. campus. The Michigan marching band might want to consider holding a similar vigil to protect one of the more hallowed spots on the University of Michigan campus in Ann Arbor, the "Block M" embedded upon the campus Diag. Someone, assumably a Michigan St. supporter, painted the "Block M" Spartan Green. The letters "S" and "U" were painted next to it. This is another one of those incidents that quit being funny after the poisoning of Toomer's Corner. Michigan St. has dominated this rivalry over the past few years. Whoever did this probably should have been satisfied with the on-the-field embarrassing of the Wolverines. (UPDATE) The Rock on the University of Michigan campus was also painted Spartan green and white Tuesday night/Wednesday morning.